The hotel is situated on the main street between Ios village and only 2km from the famous Mylopta Beach. It is also only 500 meters from Hora, in the region of Agios Ioannis. Hermes is the first-class hotel, built according to the traditional architectural style of the Cyclades, in the colours of white and blue, equipped with all modern comforts and facilities for pleasant and relaxed holidays. The 27 clean and comfortable rooms have bathrooms, balconies, air conditioning and a fridge. There is also a living room, TV lounge, telephone, cafeteria, snack bar and a refreshment stand. In the roof garden of the hotel there is a swimming pool with deckchairs, umbrellas and a pool bar. To make your stay as comfortable as possible, the hotel also provides a private parking area, car and bike rental, free transport from and to the port, fax services, internet access, safety deposit boxes and first aid. And the reception area (open: 8am-4pm and 7pm-11pm) staff will be glad to offer you their services as well as useful information regarding the island. A maid service is also available. 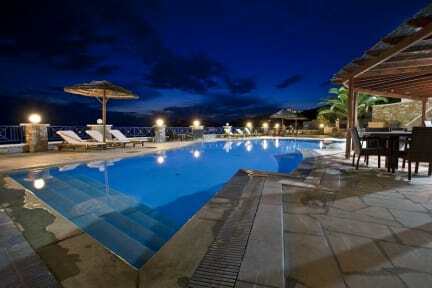 The hotel offers panoramic views of the Aegean Sea and Santorini.